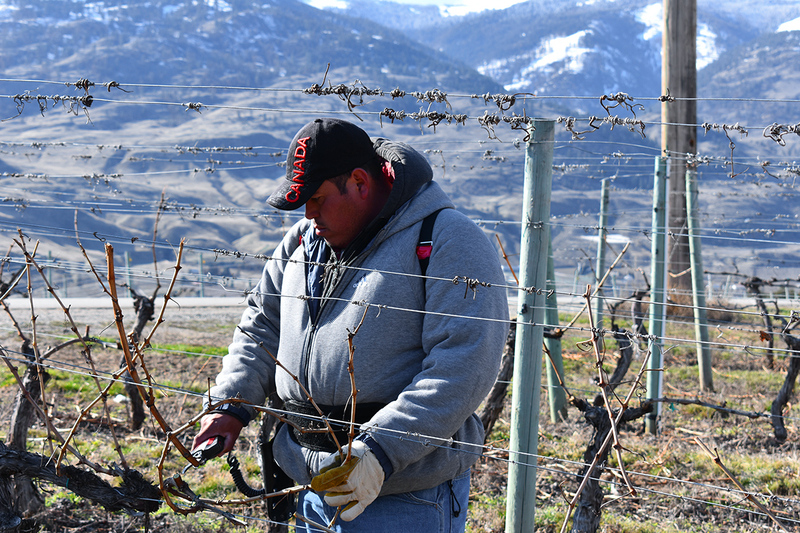 Pruning on a gorgeous spring day with the Okanagan Highland foothills in the distance. So, why do we prune? To state the obvious, it’s important to remember that a grapevine is a vine. When you find grapevines in nature – and you do throughout Canada and the United States – they’re often crawling up fencing, houses, or trees. This is not what you see when you drive past a vineyard. Left on its own, a vine will continually grow. This is problematic in a vineyard for a number of reasons. For example, vines will begin to shade one another, resulting in uneven fruit ripeness. Pruning is one of the means by which to limit the growth of the vine. Ernesto removing last year’s canes, which will be tilled into the vineyard. 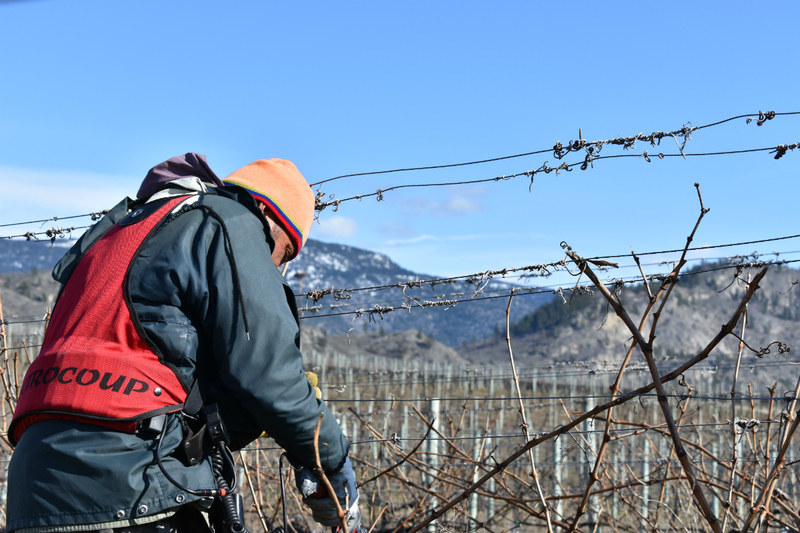 When we prune, we’re removing much of the growth from the previous year as well as establishing how the vine will grow in the upcoming season. This is critical because it is the first chance to set the balance and yield of each vine. On a vine-by-vine basis, we’re determining how many buds to retain, which will determine how much fruit is produced. Vines are typically pruned in two different ways: cane or spur pruning. The former keeps one or two canes from the previous year, which are tied down to the trellis wire. Spur pruning retains short canes, or spurs, on older wood called a cordon. At Phantom Creek, we typically use cane pruning. This is more laborious and time consuming, however we believe it is ultimately better for the health of the vine. With fewer cutting wounds and less old wood, there is reduced potential for disease or virus. Grapevines are similar to people in a lot of ways. Cane pruning also helps to keep yields low and vines in balance. Ignacio cane pruning Block 1E, Cabernet Sauvignon, on Sundial Vineyard. 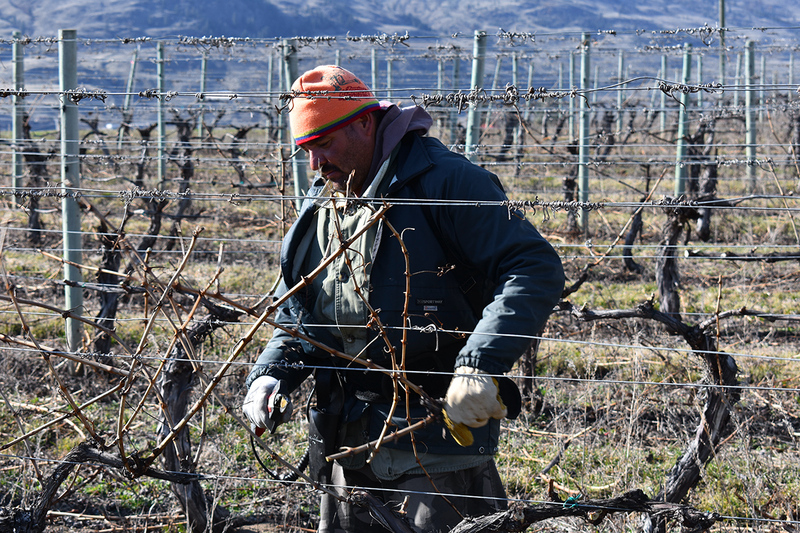 Our vineyard team uses electric pruners to save time and prevent repetitive strain injury. However, we’re not dogmatic. Some vines we may decide are best spur pruned for the upcoming growing season. We are also testing a spur pruning trial on a block of Syrah on Sundial Vineyard. This trial is based on our Vineyard Manager John’s recent visit to Côte Rotie, where he saw winegrowers retaining fewer spurs closer to the head of the trunk. The thought is that this technique may promote more balanced fruit ripeness. A spur pruned Cabernet Sauvignon vine on Phantom Creek Vineyard. As we finish pruning both Phantom Creek and Sundial Vineyards, it is a sign that spring is (finally) approaching. And we can look forward to budbreak and the start of the growing season in the weeks to come. Have questions about pruning? Reach out to us on Twitter (@phantomcreekest) or Facebook (www.facebook.com/PCEWine).